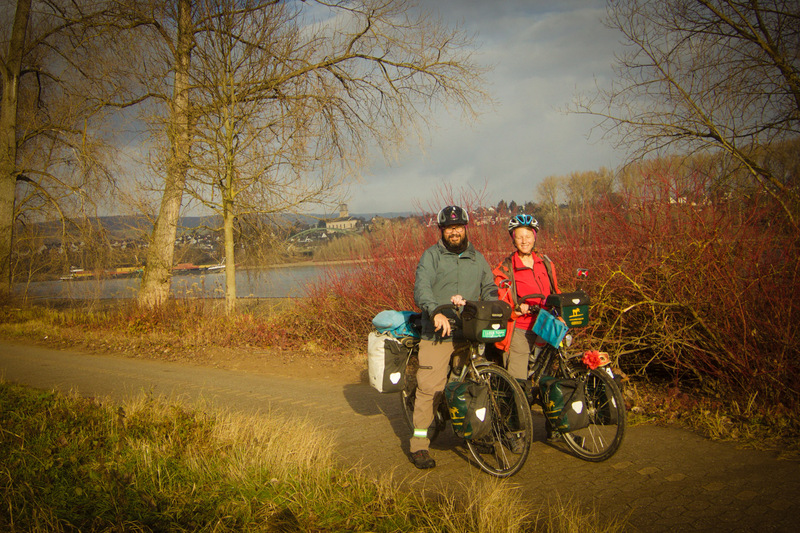 Annika and Roberto, Tasting Travels, have just returned from their five year journey by bicycle. 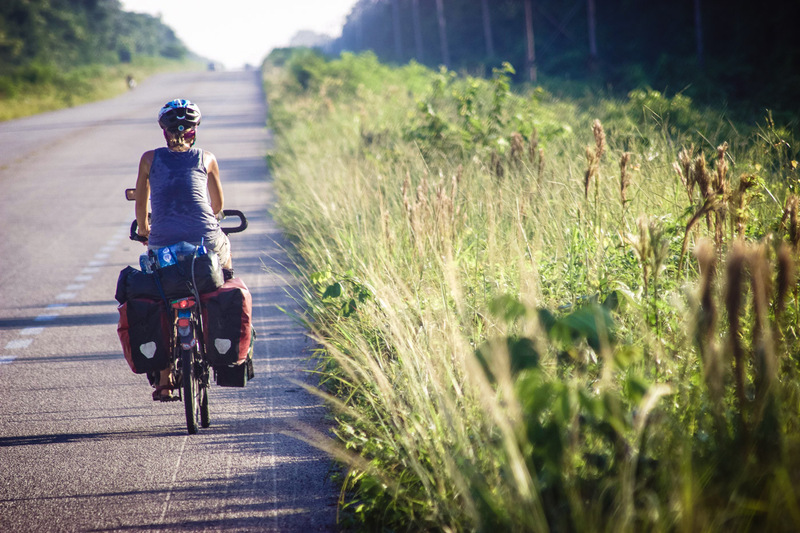 In this interview we get to know Annika aka Indiannika Jones a little bit better, we learn more about their journey to promote empathy and she gives insights into some of her feelings and routines as a bicycle traveller. Annika, can you tell a little bit more about you, how you grew up and what you find important in life? I grew up in a little town in Northern Germany. There was a forest two blocks away from my home, where we used to play. The highest point in my village was the “wind mill mountain” with its 29 meters above sea level. As an adolescent I was always too lazy to cycle (especially not up that mountain), so I walked everywhere. I studied in the even flatter town of Bremen where I discovered the bicycle as a means of transportation. Friends say I am one of those positive people who just give things a try. That’s exactly how I started a 5-year bicycle travel as the very first multi-day bike tour in my life. Learning is something I find important. And I don’t mean sitting home and studying for university. What I mean is being curious, asking, trying new things, getting to know people, trying to understand their point of view on things and learning new stuff. Respect and helpfulness are some other skills I find important in people. What’s important to me in life is something I learned early: staying positive and simply making the best of your situation. So we’re back from a travel, we’re homeless and unemployed? Great, that’s a perfect point to start over again somewhere new, apply for any kind of job I am interested in, live in a town I like. And there’s something else I learned later in life: taking risks when they are worth it. Having grown up in the German countryside I was taught to always try and go with the safe option. But when there’s something risky, that matters a lot to you, then I believe you should go and try the best you can to get it. No matter the odds at first. 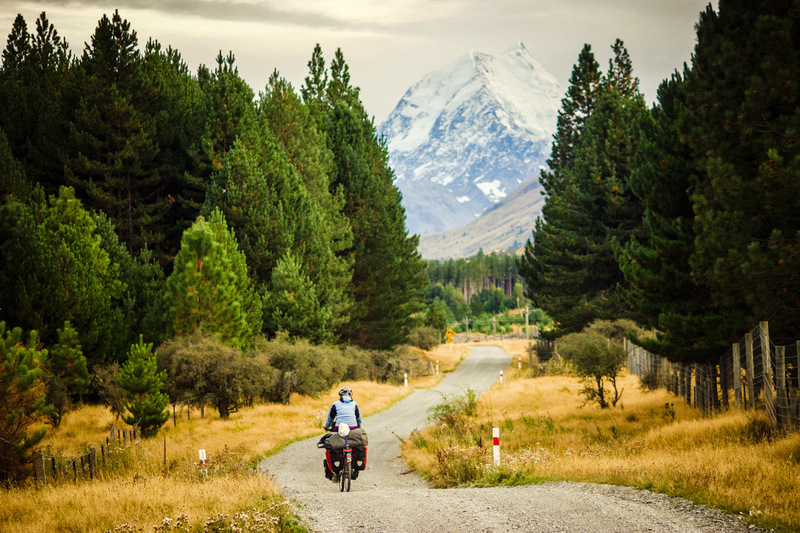 Recently you returned from a long bicycle journey, where did your journey take you and for how long? It was a journey of 5 years and 3 months and it took me and my husband from home through Austria, Slovakia, Hungary, Serbia, Croatia, Macedonia, Greece, Turkey, Georgia, Armenia, Iran, Turkmenistan, Uzbekistan, Kyrgyzstan, China, Laos, Thailand, Cambodia, Malaysia, Singapore, Indonesia, Australia, New Zealand, Tonga, Canada, the USA, Mexico, Spain and France back to Germany. We weren’t cycling all the time, as we worked the first winter in Turkey, then an entire year in New Zealand and another half a year in Mexico. And also we moved real slow in Southeast Asia. A three-day stop here, a five-day stop there, a week for this, another week for that. Why hurry? You gave yourself the project to cultivate empathy while travelling. How have you formed this project and what did it mean to have this as an extra goal during your journey. When we first started, we decided to write articles about people, places and cultures. We wanted to try out new things for ourselves, play local games, sleep in a hammock etc. We wanted to have a little taste of the local’s life. Therefore we founded Tasting Travels. Later in the journey we read more and more about empathy and realised that most cycling travellers are automatically very empathic people. 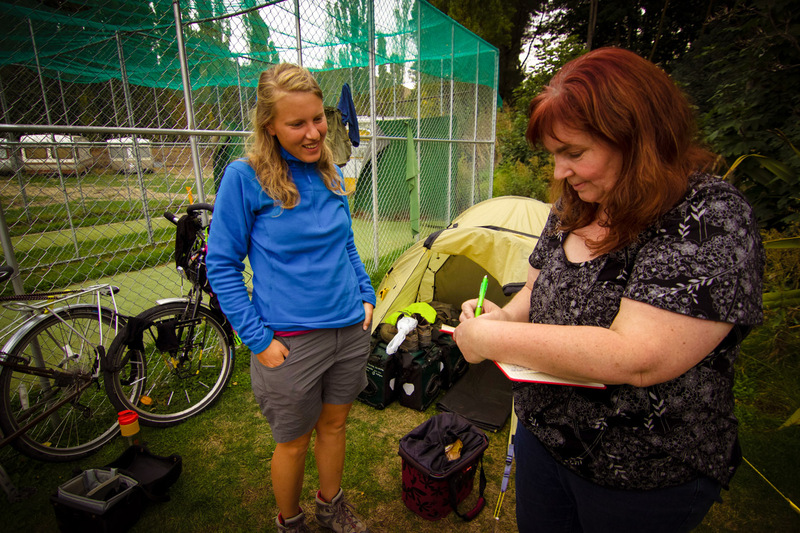 Tasting Travels now wants to promote bicycle touring as a model to cultivate empathy. So we went from more journalistic articles to both, articles and blog entries, and we began giving free presentations at schools and universities. Our presentations deal with empathy and cultures, we want the young (and not so young) ones to get on their bikes and get to know their surroundings, talk to people they usually wouldn’t talk to and find out how they see and feel. We want people to be more understanding and able to put themselves into the shoes of others. That would help us all a lot. With our project we felt fulfilled, we had a chance to make some money with it (not enough to solely live from it, but a bit of income here and there) and we were busy growing it to a decent sized thing. You can say we started a brand there. When and why did you decide to set out on this journey? Ever since I held my first school atlas in my hands, I wanted to travel the world. As a kid I collected maps (and I still do) and read travel reports (same). When I met Roberto I told him that once I finished university I would want to go and see the world. So he decided to give up his company and flat and join me. Many people would call it crazy, but we both had a good feeling about it. It was a grey September afternoon when we decided that rather than waiting for an amount of saved money, we’d better simply set a date and save as much as we could till then. We set the date for a year later and – rather an exception on this travel – actually left as planned. The idea to ride bikes came quite late, but cycling sounded easier than horses or kayaks and faster than hiking. We decided to give it a try. 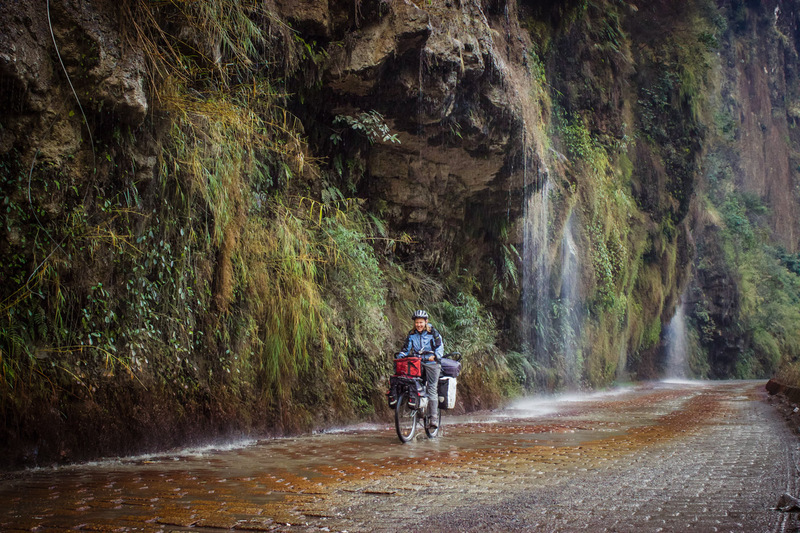 It had been the first bike travel in my life and it ended up taking over five years. If you look at day to day bicycle touring then what is your favourite time of day when you are on the bike? I love the last hour before sunset, it’s when I often get another push of energy. And that’s when I scan the surroundings for camping spots and often that’s also when I can see some wildlife. For safety reasons we try to avoid cycling at night, but if we do find ourselves on the bikes under the stars, it’s what I love. It’s too dark to see the bike computer or the gears so I just keep pedalling. In hot areas it has cooled down a bit by nightfall. I guess what empowers me in the morning is simply curiosity on what the day will bring. Unless it’s a very boring stretch, then it is just getting it done and get to some place. Often it’s motivation enough that it’s not raining or freezing. Do you stick to a certain rhythm while cycling? I do have a rhythm in my biking. I never realized, until we biked with other people and they rode sometimes fast and then slow and fast again. For me it’s easier to stay at the same (relatively slow) pace. I’m not sure if we have a daily rhythm. But we try to have a break every 20 kilometers, sometimes 30. But then again it all depends on what the day brings. Lately we’ve turned into early risers, so if we oversleep and feel lazy we rather stay another day than leaving all too late. That hasn’t always been like that. In Uzbekistan we sometimes left a town by 4pm. 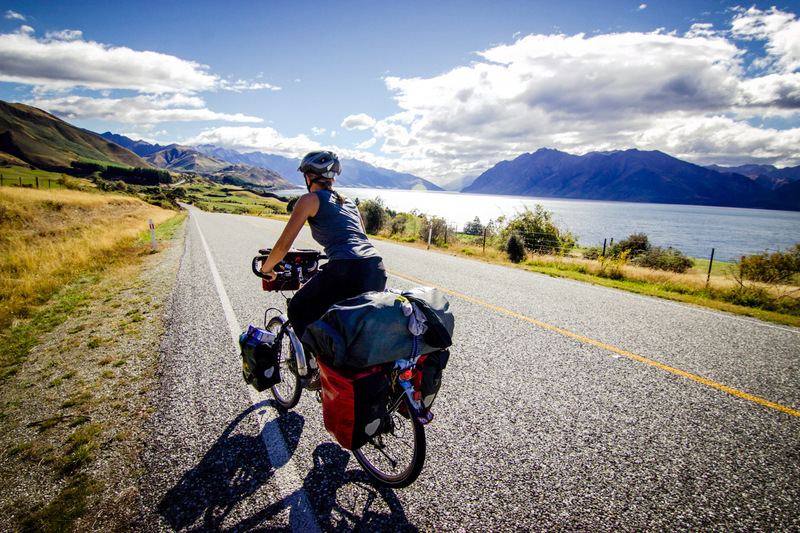 Has bicycle touring mentally challenged you? What were the most challenging moments? Yes it certainly has! All that time to think! I remembered a lot of childhood stuff that I thought I had overcome. In my imaginations there were job interviews with fictional companies, I had talks in my head with old buddies, I even apologised for stuff from 20 or more years ago and sometimes I imagined how coming back would be like. I learned a whole lot about myself. But sometimes it’s lighter and I just have an annoying song stuck to my head for days and imagine my life as a rock star or wonder what would happen if Jon Snow ever met Daenerys Targaryen. The most challenging moments were the boring stretches for all the profound thinking, as well as the really long climbs. In the first two years I was terrified of anything uphill and it has happened that I ended up crying on the side of the road wondering why my legs weren’t stronger and when this climb would end and why I had freely decided to do this without even being paid for it. I’ve made my peace with the mountains now though. They keep the wind out. Headwind is my new enemy. And I believe the very worst moments are usually when you’re sick and a bit depressed and you question everything you’re doing. No income, no security, no home and nobody around speaks a language you know. That was when Roberto helped me though. I really admire the solo travellers for their braveness when they are sick and depressed. 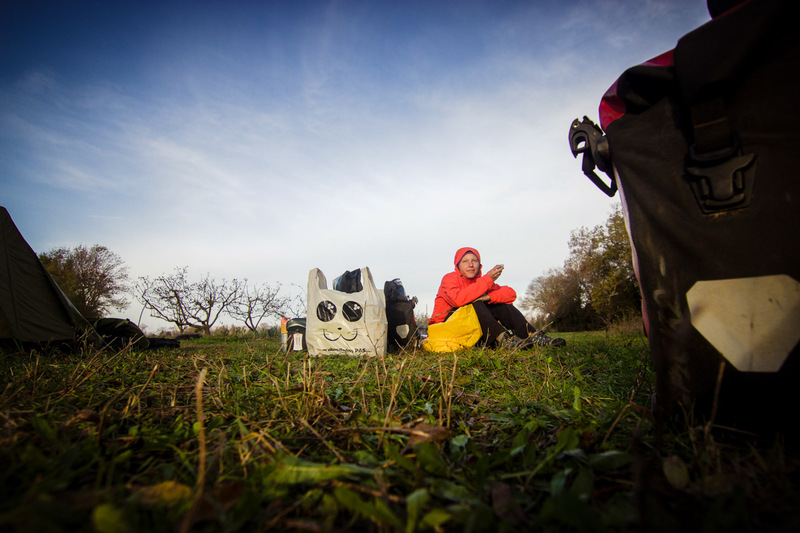 What makes you happy and sad while bicycle touring? With which observations of the world around you did you struggle the most? What makes me sad are roadkill and trash. I see so much of both on the roadside! When we biked through many and more kilometers of rubber trees and palm oil plantations it hit me that this was real. It was right here and all of this was manmade. And there I was cycling with food and shampoo that probably contained palm oil too, feeling terrible for just letting it happen. What makes me happy is when people greet me back with a smile. Have you ever contemplated giving up cycling? I am a very stubborn person. That’s an annoying thing most of the time for most of the other people around me. But it’s also my main reason to finish things I’ve started. I don’t just give in so easily. I’ve never really seriously considered giving up. But also we had three off-the-bike stops for several months and simply worked some place for a while, that’s good to get new motivation. How would you describe your comfort zone and has it changed over time? That’s a good question. I believe it’s being inside when it’s cold, grey and windy outside, I see myself in my pyjamas, warm and snugly, with a blanket, a big bowl of fresh and hot pudding and a good book or a funny TV show. This level of comfort is rather flexible though. There’s an on-the-road version of it. I’m equally comfortable in a brittle hut or the tent, with my sleeping bag and dirty but warm socks, eating the last few warm noodles. For me I believe in its lowest level comfort is keeping the wind and the rain out. Or if it’s hot it’s a shady place, a little breeze and a cold beer. I don’t know if this is even what a comfort zone means, but that’s what comes to mind when I think about being “comfortable”. It’s funny how my comfort zone has changed. While at the beginning I was happy camping every day and having a shower in a river, I now prefer a room with a door for my shower, warm water if it’s a cold day (bucket shower is still fine though) and a real bed every now and then. Guess it has to do with my age. Being able to poop in the same clean toilet every day, wash the dishes with actual water instead of baby wipes, and not have all my belongings squeezed into a couple of bags, was one of the reasons that made the return easier. Are you sometimes scared or unsure about yourself? Sure I’m unsure about myself sometimes. Who isn’t? Life can be scary sometimes. But so far things have always worked out somehow. Why wouldn’t they now? Do you have a personal mantra during tough times? I don’t have a mantra, but I’m generally a positive person and that’s helped quite a lot. I like to have a plan B and C and D ready before I even start plan A, so I won’t be too disappointed if things didn’t work out the way they should. And sometimes I simply think how good it is to be together and to be healthy and that nothing else really matters all that much. Makes me feel better when I feel pressure or stress. What is the best gift you can give yourself while bicycle touring? The best gift is mostly food. Lot’s of food. And a hot chocolate in the cold or an ice cold beer on a hot day. A shower after some dusty days comes right there on number three. What is your personal favourite piece of what you have in your panniers? It’s much more what we have on the panniers than in them. Friends and strangers alike have signed our bags, starting in Greece all the way back home. It’s their lovely wishes and drawings that matter most to me. It’s the most precious thing we have. Number two might be my map collection. What is your most practical piece of gear? My most practical piece of gear would probably be a picnic blanket. Ever since we let go of those old big foam sleeping pads and got inflatable ones, we can’t use them to sit outside anymore, for there might be thorny plants. So we sit on the picnic blanket in the evenings and sometimes for actual picnics, we use it as a mud-free red carpet to the tent entrance or if it is a rocky ground, to protect the tent floor. It’s great for the beach too. It’s a bit bulky I have to admit, but that’s fine with me. Has being a woman provided you with unique insights? It certainly has! I once was invited by a Chinese farmer to stay in her room. I wanted to grab my sleeping pad but she offered me her bed. So I laid down and she grabbed a pillow, laid it near my feet and got into bed too, but from the other side, each of us facing her feet towards the other one’s nose. Roberto spent that night alone in the men’s sleeping room, while the lady’s husband slept in the grandson’s bed. Imagine you’re working in your garden, when a dirty foreigner who doesn’t speak any language you know, approaches you. She asks for a place to camp, but you offer her a shower and share your own bed. I was blown away. So that’s something I wouldn’t have experienced if I had been a man. Being a woman on tour has both its advantages and disadvantages. Most people’s first thought is the safety. They say it’s probably less safe for women. Sexual assaults are more common on women than on men. Men sometimes see women in general as easier targets for an assault. But being a woman certainly also has its advantages. In many parts of the world men still do all the outside-the-house things and women spend most of the day at home. So I mostly met men during the day. When I hitchhiked through Mexico, people gave me rides very easily, fearing that if they didn’t take me, something might happen to me. So all my drivers were very respectful and nice people. People often believe that “women must be helped in this world full of evil men”, so I got offered shelter very easily. It’s sad though, that people sometimes have so little trust in the other people. Most men I have met were very helpful. Both men and women sometimes see women as fragile and in need of help, so they tend to offer their help easier than they would if I was a man. I also got to talk to the women in Iran without anybody thinking I was a creepy and horny foreigner. As a westerner I got to talk to the men and as a woman I got to talk to the other women. That was a big advantage. I must mention that in over 5 years I’ve not once found myself in a dangerous situation with people. There have been a few minor things, mostly drunk and therefore rather cuddly men, an exhibitionist in a marketplace, guys who wanted their picture taken with me, so they could pose and hug me etc. I was glad Roberto was there with me. But I would have managed by myself too, it was a lot about showing self esteem and being clear and direct to the people around me. It always worked out in the end. Roberto and I have decided that for the sake of peace it’s better that everyone fixes their own bike and the other one won’t interfere until asked for help. Often men offer me their help when they see me fixing my bike in public. They shake their heads on the sight of Roberto standing there doing nothing. That can be an advantage if you’re lazy and trust them to do a good job or if you have poor mechanic skills yourself. But it had also happened that they simply grabbed my tools and gently pushed me away. “Go away, woman, let me do that for you, what do you know about mechanics?”. That’s frustrating. Peeing outdoors is a bit of a disadvantage too. We can’t just turn to a tree on the roadside. I’m lucky not to have too much struggle with hormones and periods etc. In those time periods I might be a bit more whiney and cranky for some days a month, but it’s poor Roberto who has to live with me those days. I can recommend the cup though, much easier for outdoor use. You spent quite a while in Mexico, the country of your husband Roberto. What did you do there and did you base yourself there for a while? It was my third visit to Mexico. Our plan was to spend winter in Tijuana with Roberto’s family, and go back on the road in early spring. Plans changed and we ended up staying till early May. We used the time to prepare some projects that would fill our wallets up enough to bike through Mexico (one of them a bike route through the Baja California, website to be announced). I also found a job as a German teacher at a school for adults. And also we got married! What advantages have cycling as a couple given to you? Cycling as a couple has the great advantage that there is no jealousy when we stay at some place. If a man brings a solo travelling woman home, the neighbors and the wife’s friends might talk. If a woman takes a man to her place for shelter, she might only do so if she feels that it is really safe. As a couple we’re neither seen as a threat nor as a rival. Also sometimes when we are split up in groups of different genders, we can tell each other everything about what the other one has missed. There are many advantages for cycling in groups of two or more. Prices for hotels drop, same with cooking. There’s less things to carry because we share the tent and the stove. And most importantly for me: there he is with me. In difficult situations we struggle together, he cheers me up when I’m upset, I cheer him up when he is. We’re there for each other in good and bad times and we never truly feel alone. The disadvantages are just as clear. You can’t decide anything on your own. For example, I want a break, he wants to do another 10 kilometers. I want nutella he wants peanut butter. Then I want to go left he wants to go right. I want to continue, he wants to stay… The list never ends. The freedom and spontaneity are reasons why I love travelling on my own, but with all the compromises I still prefer having my husband on my side wherever I go, as cheesy as that may sound. How do you handle being together, do you have different roles, etc? In order to avoid arguments we began to split tasks. Neither Roberto nor I were experts in anything bike travel related. So I chose to be responsible for route, orientation, finances, visas and at first for Warmshowers, because I like that kind of stuff. Roberto chose some other tasks. We had much less arguments after that. Roberto is the stronger one. So sometimes I try to push myself a little further for the next break, but in the end my limit is our limit. I always cycle in front. That makes it easier for Roberto to stick to my rhythm. It’s only the steepest climbs when Roberto can’t handle the very slow pace and overtakes me. It’s a bit discouraging at times that after a hard climb Roberto seems to be still top fit, while I’m more sweat than person, but he says that he’s tired too. I can’t go faster than I can, so he has to stick to my pace or wait. Since I’m the one with the map and he’s the one with the rear reflector, he rather stays behind me anyways. 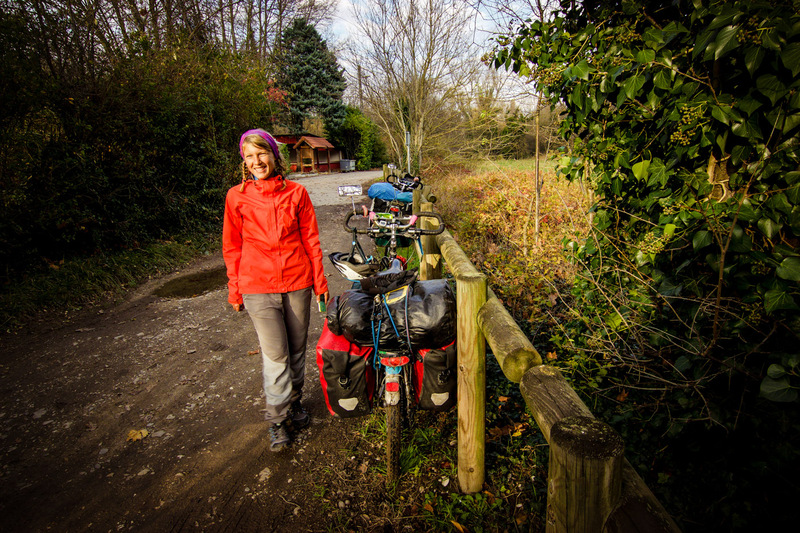 What would you tell other women who are thinking about the idea of heading out on travel by bicycle? What would you have wanted to know before setting off on your journey? I always expected it to be much more difficult than it actually was. The staff in the bike shop laughed tears when I showed them my rather simple second-hand-discounter bike. I was not a very sporty person and I had never done any bike tour in my life. I did not know a single thing about bike mechanics and did not bring any adequate equipment. Leaving the safe bubble behind, living without a monthly income, cancelling the apartment and simply heading in the unknown might sound scary at first. It’s not. Let me tell you about our first day. It wasn’t a big deal. We had said goodbye to everyone a few days earlier already. We were so busy trying to cycle with panniers for the first time and we were so confused trying to find the right way that we hardly noticed how we slowly left town. There was a little wind and I felt good, I felt free, I felt happy and excited. So many new adventures. Leaving was easy. There’s no training needed. You get tired, you have a break, you get tired again, you have another one. You get really tired, you pitch your tent. As simple as that. It feels good that all you need to really do every day is find a place to sleep, find food to eat and make the money for those two things. No meetings, no deadlines (other than visas), no monthly payments (other than maybe health insurance), no cranky landlords, yelling bosses, events that you said you’d go and now you actually don’t really want to but don’t want to let others down. It’s as simple as that. Sure it means you miss out on a lot of things too. You won’t see your family a lot, you might return with new family members while other members might have passed away. It means that while others start a family, build a house, drive a nice car and get promotions, you’ll have to start on zero again. You won’t even have furniture, no car, no job, no home. Sounds scary? It’s not. Let me tell you. I’ve just returned from 5 ¼ years on the road. I haven’t been home in five years. I’m 30 now, no job, no kids, no home and not much savings left. My wardrobe is 90% outdoorsy stuff. I’ll be the oldest trainee or intern any company has ever seen if I’m lucky enough to find an employer who hires me, despite the risk that I might pack my panniers and leave everything behind again. I’m back on zero. It’s not that scary. This is a new chance and it’s exciting. I’m sure something good will happen. It always has so far. We can move to where we want and apply for any kind of job. What do we have to lose? If I could go back in time, I’d grab my bike and leave everything behind again. It’s so very much worth it. It’s easiest to check www.tastingtravels.com/contact and click on the place on the map that you’re interested in reading about. You can also follow us on Facebook and Instagram and every now and then we tweet something.